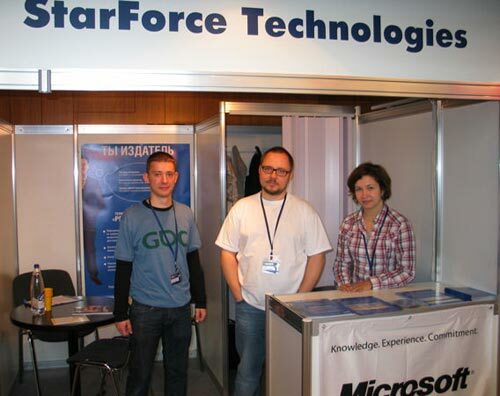 StarForce participated in the biggest Russian annual Game Developers Conference – KRI 2009. Within conference company’s representatives conducted the round table event concerning MMOG threats counteraction. Leading industry specialists representative Nival Online, IT Territory and Web Interactive World share their points of view on bots, cheats, hacks and unauthorized servers problems in network of MMOG sector during three-hour talk. Due to world financial crisis this year event was notably smaller in size. Many of companies refused to participate with booths and only sent their representatives. That’s why conference hall was pretty crowded. During conference StarForce ran negotiations with all leading Russian developers and publishers. In general all talks were about implementation of brand new company’s product StarForce MMOG. Following the negotiations agreements StarForce will open several test projects for those companies that interested in trying StarForce MMOG on their games. Estimating the conference results Julia Titova, Head of Russia and CIS sales department of StarForce Technologies, said: “Traditionally KRI passes in warm and very fruitful setting. Industry people openly share their opinions and visions on current market situation and trends. I estimate conference results as very successful. We managed to synchronize our stands with all major Russian & CIS clients and gained new contacts”.